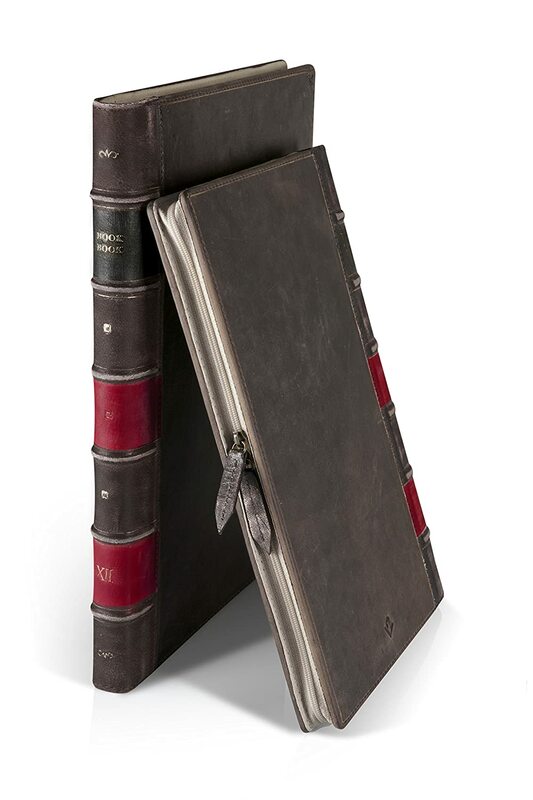 This Leather Book Sleeve for MacBooks is a pretty cool and sorta-kinda-retro way to protect your expensive MacBook. It looks like a really old leather bound book when closed. Maybe an old book or maps or encyclopedia but, inside the double-zippered compartment is a space designed to hold a 15″ MacBook Pro. Each case is handmade from genuine leather. They’re made with reinforced corners and a cushioned spine to absorb outside impacts, along with a velvety soft interior to cushion your MacBook open or closed. The artificially distressed leather exterior is what the manufacturer calls “Rutledge“. Think of it as a reddish-brown with age spots all over it. It really helps complete the illusion that you have an antique book instead of a new laptop. However, if that’s not your style, there’s a “vintage leather” option. That option is black with red highlights on the binding. Don't like the Rutledge look? How about Vintage Leather? It's also $20 less expensive. Oh, you couldn’t afford the 15″ MacBook without selling a kidney or taking out a 3rd mortgage? OK, no problem, there are versions for the MacBook versions as well. Just check out the options on the Amazon page for more details. Dimensions: 14.9 x 10.5 x 1.2 inches.